For some 150 years, black legislators have leveraged their power to educate, advocate, and steer landmark progressive policies into law. With grit, sacrifice, and strategic determination—even in the face of violence—they transformed the legal and economic landscape in America. Today, the country faces a resurgence of violent white nationalism that has taken root in a political environment that threatens to undo the progress men and women have given their lives to achieve. 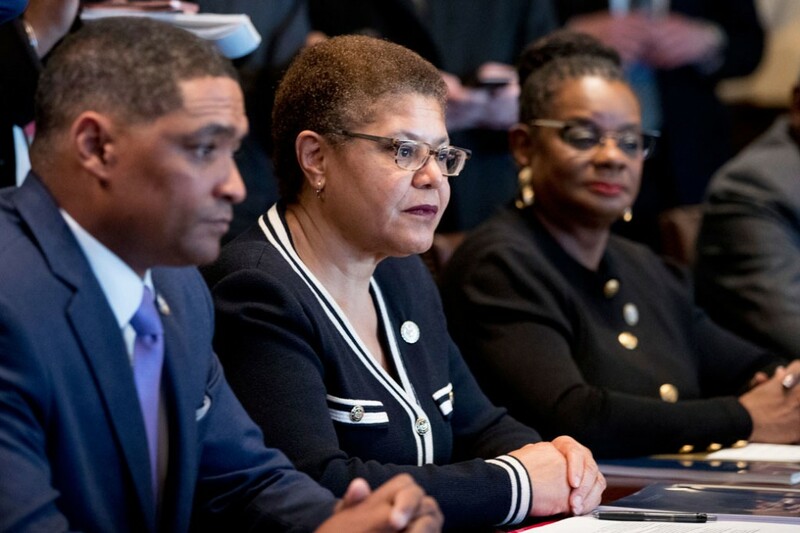 As the Congressional Black Caucus (CBC) holds its annual legislative caucus, celebrating its 47th year, the nation must remember the influence that collective power can have when committed to a cause. Since the end of the Civil War, black legislators have fought against hate and advocated for equality and economic opportunity for all. In 1871, Joseph Hayne Rainey, the first African American member of the U.S. House of Representatives, leveraged his position as a congressman to sway his colleagues and secure votes for the landmark Ku Klux Klan Act, which protected African Americans and their white allies from violence committed by the KKK. Almost 100 years later, Shirley Chisholm used her power as the first African American congresswoman to lay the groundwork for the Supplemental Nutrition Assistance Program (SNAP) and the Special Supplemental Nutrition Program for Women, Infants, and Children (WIC). Today, SNAP serves more than 45 million Americans of all color and creeds, while WIC helps more than half of all infants born in the United States. From civil rights to health care reform, black legislators have left their mark on almost every piece of legislation that extends protections and opportunities to marginalized communities. While these efforts have benefited countless Americans, they often came at great personal risk to the legislators themselves. In the years leading to and including Congressman Rainey’s efforts to pass the Ku Klux Klan Act, white nationalists committed acts of violence against at least 10 percent of black legislators elected at constitutional conventions between 1867 and 1868, killing seven in the process. In places such as Georgia, 25 percent of black legislators were killed, threatened, beaten, or jailed. Rainey received death threats but persisted in the face of danger, setting a precedent for black legislators that has withstood the test of time. Today, black legislators continue to endure attempted firebombings, lynching threats, and other forms of intimidation. Despite a resurgence of hate and violence, black lawmakers remain committed to creating an economy and society that works for all Americans. Forces of suppression threaten peace and equality in U.S. society. The Trump administration has made it abundantly clear that it is determined to strip away the rights and opportunities many Americans—activists, public servants, policymakers, and more—fought and died for. In May 2017, it created a commission to prevent low-income communities and communities of color from voting. That month, it also proposed slashing the civil rights arms of the departments of Education, Justice, and Labor, as well as the U.S. Environmental Protection Agency’s Office of Environmental Justice. In July, the administration failed a monthslong attempt to strip health care coverage from tens of millions of Americans. In August, it began reallocating civil rights resources to undermine programs that help people of color attend college. And since its inception, the Trump administration has called for longer prison sentences, civil asset forfeiture, and increased police brutality and militarization—efforts that parallel those during the war on drugs. Beyond its baseless and draconian policy proposals, the administration has also validated hate speech and blamed white nationalist attacks on counterprotesters. Almost 250 days into the administration, there is no indication that it plans to cease its dangerous campaign to disrupt marginalized communities. The CBC appears committed to holding the administration accountable. Since January, members of the CBC have leveraged their collective power to fight back against the administration’s constant attacks and unethical behavior. For instance, Sen. Cory Booker (D) and Reps. John Lewis (D) and Cedric Richmond (D) made history by testifying against then-Sen. Jeff Sessions’ (R) nomination to serve as attorney general, correctly predicting his hostility toward civil rights, equal rights, and justice for all. Rep. Maxine Waters (D) leveraged her position as ranking member of the U.S. House Financial Services Committee to investigate the president’s financial ties to Russia and rally the public against any tax proposal that would benefit the wealthy at the expense of low-income families. Rep. John Conyers (D) led nearly 200 Democratic members in filing a lawsuit against the president, accusing him of violating the Emoluments Clause of the Constitution by accepting payments from foreign governments while serving as president. Together, the “Conscience of the Congress” introduced anti-voter suppression legislation; condemned the administration’s divisive policies; and demanded the removal of white supremacists from the White House. Almost 50 years ago, members of the CBC were among the first to call for then-President Richard Nixon’s impeachment. Today, they remain committed to using every tool available to them to ensure that all Americans, regardless of background, have equal access to opportunity. Lessons of the past remain useful to the present—and one of the most important lessons in our nation’s history is that when America empowers black legislators, black legislators empower America. Connor Maxwell is the research associate for Progress 2050 at the Center for American Progress. Danyelle Solomon is the director of Progress 2050 at the Center.